Aesthetics, Skin & Wellness Clinic: The Diamond Dermabrasion Medical™ Experience. The Diamond Dermabrasion Medical™ Experience. In the quest for youthful, vibrant skin, men and women alike share a common vision: a desire to look their best, regardless of age. Traditional options, ranging from chemical and laser techniques to cosmetic surgery and drug therapies may not be right for you. Perhaps they are inconvenient, invasive, or just too expensive. 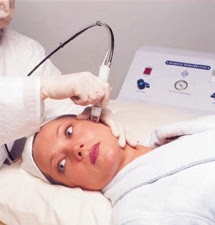 Diamond Dermabrasion Medical™ technology, however, can easily bring you closer to healthier, younger-looking skin. The Diamond Dermabrasion Medical™ is the integrated option for modern skin care. It complements most treatment programs without interference, providing a gentle yet effective, mechanical peeling of the skin called microdermabrasion. Microdermabrasion is derived from an age-old treatment called dermabrasion. The new Diamond Dermabrasion Medical™ system, however, is modern and uses a gentler approach. It features a patented dual control system and adjustable applicator head that delivers a steady, effective stream of fine crystals directly onto the skin. The old surface is removed, leaving it smooth, fresh, and rejuvenated. 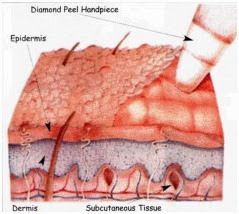 The Diamond Dermabrasion Medical™ treatment erases epidermal layers at varying depths in a safe, controlled manner. This approach respects the integrity of skin and promotes even healing. Maintaining level cellular growth on the surface aids in the youthfulness of the skin's appearance. On average, we renew our skin surface every 10 days. However, with age, poor health, or lack of care, cel renewal may be considerably slower. Regular Diamond Dermabrasion Medical™ improve many skin conditions and imperfections, to create a healthy, balanced skin surface. Advanced engineering technology, combined with the collective experience of physicians and international skin care experts, makes the Diamond Dermabrasion Medical™ the most desirable option in microdermabrasion. A series of treatments achieves the best results, allowing for more effective control and a focus on individual skin conditions. The Diamond Dermabrasion Medical™ is fast and virtually painfree. It leaves little or no redness. It can help to minimize the most difficult skin conditions, or to rejuvenate and maintain the health of the skin. Treatments take less than an hour and should not interrupt your busy schedule. NOTE : The content is adopted from Diamond International's website. was an article I liked. Thanks for sharing. 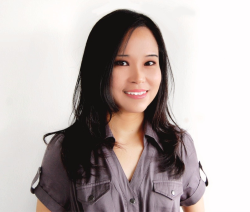 I am a MEDICAL DOCTOR with the following qualifications:- Family & Aesthetic Physician MBBS (Malaya); Dip.F.P.Dermatology (NUS, S’pore); Diplomate in Aesthetic Medicine (US); PG Cert. Dermatology (Mal). I am a KL kid and I am a proud CBNer :-)I love anything beautiful. Approx 30 mins from KL City. Microneedling for: acne scarring & many more.